Six of Pentacles (R) says that if you are experiencing an unsatisfactory situation – accept your feelings. Feelings of insecurity are created when you are not recognized for the hard work that you produce or when a stable, but basically unequal and unsatisfying situation has been disrupted. Feelings of insecurity result in dissatisfaction as you begin to think that things are unfair and your prosperity is threatened. Any relationship is based on the dynamics between those who have and those who don’t. Doling out attentions, promises, “sexual favors” or finances can be a manipulative means of keeping people bound to you. You are now learning to give with no conditions, according to your ability and to receive what is freely given you – for only then will you find true stability and security in your relationships. When success is measured in terms of what you give – everyone shares in it. If success is measured in terms of what you get, you will always be chained to the need for more. Release your defensive attitude. There is an indication that your situation – emotionally or economically dominates you – giving you very little, but just enough to keep you from looking for something else. Analyze your situation very carefully now. Does your job give small material benefits with little satisfaction or chance for improvement? Are you involved in an unhappy, yet comfortable relationship? Do you feel your situation is oppressed, yet find that you do not want to endanger what little security you do have? In situations like these – nothing is ever truly reconciled – the situation maintains balance and just keeps going. Can you show generosity and give spontaneously or do find that you measure out what you think you can afford to loose and give only what you will not miss? Do you find that you relate easily to others – while always hold back your deepest feelings and allowing yourself to accept only limited “gifts” from others? Does the display of strong emotions embarrass or scare you? Do you find that you place an offer of help in the category of “charity” and give people only what you “think” they are able to receive – unconsciously measuring out your giving according to what other people expect from you – always trying to avoid making yourself or another person uncomfortable? You are challenged now to give more freely – to share from the heart and stop measuring out what you feel you can afford to loose. Release this “your win is my loss” attitude. Have the courage to continue the process you have started – it will result in a freer, more equal situation. Place yourself in the position to receive and stop cutting yourself off spiritually. Success is achieved through disciplined, step-by-step procedures – remaining open and flexible to opportunities that are presented. It is attainable as a result of following that which has heart and meaning in your life. Stay in your authenticity and truth now. Organize your communication so that context and timing are all aligned and put consistent energy into your life situations. One cannot give beyond one’s means, no matter how noble the motivation. We can share only what we have – beyond that, we are obligating someone else’s resources without their permission. Lower emotions clouding the physical. With whom are you sharing your prosperity, resources or abilities? How and to whom are you mentor, advisor or patron? How are you sharing your wealth of money, talent and information? What do you have to give that others need? What and from whom do you receive? Next to Star: Don’t give up – you are entering a new cycle now and it is important that you keep trying. Three Wands in spread: Take your mind off of work and try to find some way to relax – slow down, your health can be effected. Six on either side: You will soon know harmony – be content to let things take their natural course. In the first position: Your generosity may assume an air of duty and obligation with a number of demands placed on you to test your capacity. In the second position: Your material reserves may not be what you think they are. You may not be able to call in your chips. In the third position: There has been a serious imbalance here and it is urgent that it be corrected now. Review the general meanings (inverted) for guidance if necessary. In the fourth position: It is hard to imagine these admirable qualities being distorted, but, remember – metaphysical law demands a balance – we must accept as much as we give. At the opposite extreme, distortion brings us a person who will prefer accepting to the extreme and thus distort their soul’s need for independence. In the sixth position: There will be a significant effect in your emotional house from a material exchange. The effect could be a structural realignment of relationships. In the seventh position: This could be your not getting the backing you were looking forward to. Or, in the opposite mode, getting backing when you should not have, for instance to go to the wrong school and take the wrong degree. 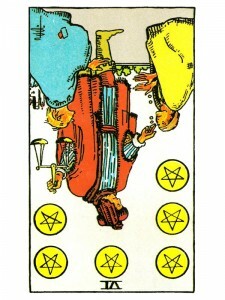 In the eighth position: This exchange is not the best thing for one or both parties, the giver and the receiver. The receiver may be worthy, but you are extending beyond your means or it would be better if they were aided by someone else. Or, it is fully within your means and it would please you greatly to help this person or group, but this particular assistance, the timing and/or you as the source is incorrect. In the ninth position: Your heart may be distorting the matter in either of the extremes. On the one hand, you may be considering doing far too much. On the other hand, you may be refusing an offer more correctly accepted. In the tenth position: There has been a serious imbalance here and it is urgent that it be corrected. Review the inverted general meanings for guidance if necessary. A little frightened here….what are the inverted general meanings ?